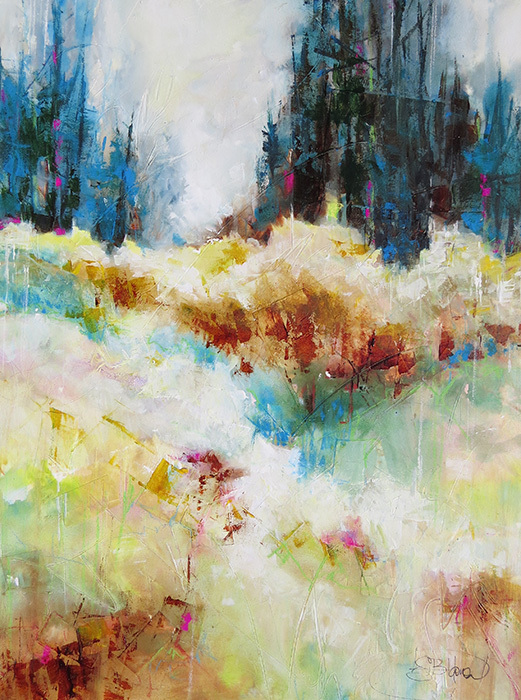 Sarah B. Hansen shows new works in her July solo show, “Nature Unplugged”, at Tumalo Art Co. opening July 7 from 4-8pm. Looking to nature to escape modern distractions using watercolor, gouache, and collage in a semi-abstract manner, Sarah’s art conveys a sensation of peace and inner strength. 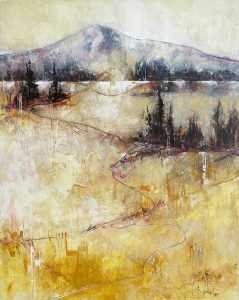 Depth and texture in her mixed-media work of the Pacific Northwest illustrate a multi-layered process of connecting back to that central core of being. Sarah is an avid outdoors woman and hiker. Using quotes from naturalists and philosophers such as Henry David Thoreau and John Muir, as inspirations for each piece, she explores the healing and becalming effects of nature on our lives. Sarah has developed a technique of painting on re-purposed, recycled Plexiglas that involves creating texture by applying gesso and collaged items in addition to calligraphic marks, words or patterns onto the sheeting. As a result, the surface becomes an intriguingly unique base for her loose, textural watercolors. Just returned from teaching a painting workshop in Italy, Sarah has another travel/art adventure to Tuscany scheduled in May 2018, as well as a workshop in Costa Rica in February 2019 teaching watercolors. She also teaches art workshops locally. Enter a raffle drawing during the First Friday Gallery Walk opening to receive a free Sarah B. Hansen giclee print! Tumalo Art Co. is an artist-run gallery in the heart of the Old Mill District open 7 days a week. www.tumaloartco.com. 541-385-9144.